She slid into the booth next to me, her bright smile brightening our corner of the bar. I can't recall the specifics of the conversation, simply the meeting of two kindred spirits. We both enjoyed hiking, (though I was admittedly a novice), whole nights spent on the dance floor and of course, throwbacks from the likes of Salt-n-Pepa and Sir Mix-a-Lot. Every day a new tableau greets me. A reminder of fun times. We headed up the mountain later than expected — my first lesson in “Nicole time”. After over a mile leisurely stroll the trail became overgrown. When continuing was no longer an option we turned back (also the point where I learned Nicole had never hiked this trail as I had been led to believe). When we found the proper trail, our lateness was catching up with us. Paying attention to our timing, we guessed we only had another hour before we’d need to turn around to make it back to the car before we lost all the light. We had come to terms with the inevitable fate that there would be no summit to end our day. We vowed to return and conquer the mountain another day. 4 years later Nicole died. When her husband called to tell me, I begged him to tell me it was a lie. I keep wishing it were, over and over again. Tackling pain with words has always been my refuge. From a young age, I learned the power of writing and its ability to make sense of pain and issues beyond my immediate understanding. And yet, in this situation, gathering my thoughts and translating them into words has only resulted in frustration. How can I encapsulate my dear friend and put her on paper? Am I not sealing her death? My writing not only makes her death a reality but a finality. It’s an act of acceptance I don’t want to take. By exploring my thoughts, confronting the pain and grief, this process of healing can begin, but it also means she’s gone and not coming back. I want it to be a lie. I want to know that when I walk into that bar she’ll be waiting with a cider in hand. The pain brings me down and then slowly, it allows me to breathe again. In those moments I can remember Nicole and the little things I want to cling to. Like the slouchy beanie that looked so cute with her short hair and even inspired my own hunt for a similarly styled hat. Or that Nicole never once commented on my life as others have done. She never exclaimed “I don't know how you do it”, or made comments like “you must have your hands full”. None of those phrases that bother the hell out of me. No, whenever I saw Nicole, she affirmed my choices, always reminding me what a badass I am. It led to many conversations about the choices parents make and the type of mother she wanted to be. 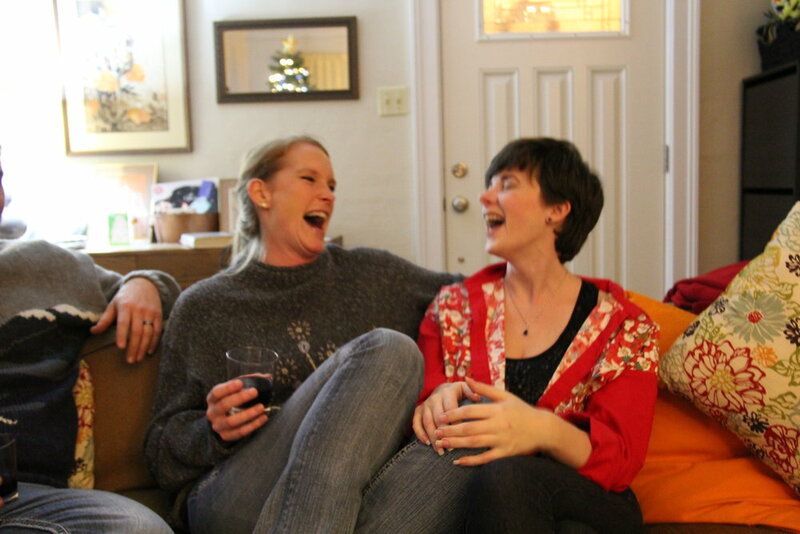 At a past annual Christmas party, we sat and talked about having children. At that time Nicole had reservations. I shared what I had learned. My advice: know that the fact that she cared deeply was proof enough that she was going to be a great mom. She would have. She would have given the care and love that every child deserves. And now, I'm back to the grief. The overwhelming sobs, that my friend will never experience the joy and pleasure of parenthood. This time it's accompanied by guilt. Guilt that I will have the opportunity to do many things that she never will. When I shared my fear with a friend she could only affirm it. This feeling will follow me forever. The sobs may lessen, but the sadness of the missed opportunities will always be there. See, Nicole recently left her career to transition into something more fulfilling. I recall our conversation about that transition and returning to school. Moving into the medical field was fulfilling her longstanding dream of helping others. It was scary, it was exciting, and in Nicole fashion, she threw herself into it. Later this year, I'll walk across a stage as I graduate with my Master's. I can only hope I can handle the transition as Nicole would. There's a gnawing in my stomach. Because I can't understand how she worked so hard, nailing fabulous grades but never getting the opportunity to finish. The guilt is back and with it tears. Another friend gave me a hug today that reminded me of Nicole. It reverberated warmth through me. Firm and long, it's the kind of hug that sticks with you. Oddly enough, it came from a redhead. This friend recalled Nicole from a single encounter — emphatically describing her as magnetic, radiating warmth, and drawing in the room in a way that no one else could. I know from reading about grief and tragedy that life has a way of comforting and bringing joy back into view. I also know that this heavy transition is an opportunity for growth. I know these things, but they give me no comfort now. They don't answer my questions, they give me no steps. They don't tell me how to offer comfort to all the others Nicole touched, because, of course, she touched many. And there's no one showing me what I can do for Nicole's husband. Everyone will tell you ‘be there for him’, as if that wouldn't be the case. But my pain is different from his. When I get up each day, my experience is nothing like his. I don't live with the constant reminder of what was. Everything keeps moving. I contemplate the days where thinking about Nicole doesn't send me into tears. I don't know when that will happen, but it's beyond the horizon. A comfort and a fear, knowing the pain will diminish and yet hoping it won't erase the memories of my first friend in Seattle. That's a memory that makes me smile. The woman who met Nicole over 4 years ago, is drastically different from the one who watched her walk away just weeks ago. We packed those years with experiences, love, friendship, adventure, and ciders. We changed and yet, we were still the same. There's still more to come and I can't help but think I'll finish some things I started, for Nicole.